Silver Spring, MD; October 1, 2018 – Acorn Media Enterprises with Acorn TV, North America’s largest streaming service focused on British and international television, is currently in production on three sole commissions – Agatha Raisin Series 2, London Kills and Queens of Mystery; and is excited to announce the World Premiere of the first TV movie in Series 2, Agatha Raisin and the Wizard of Evesham, on Monday, November 19, 2018. 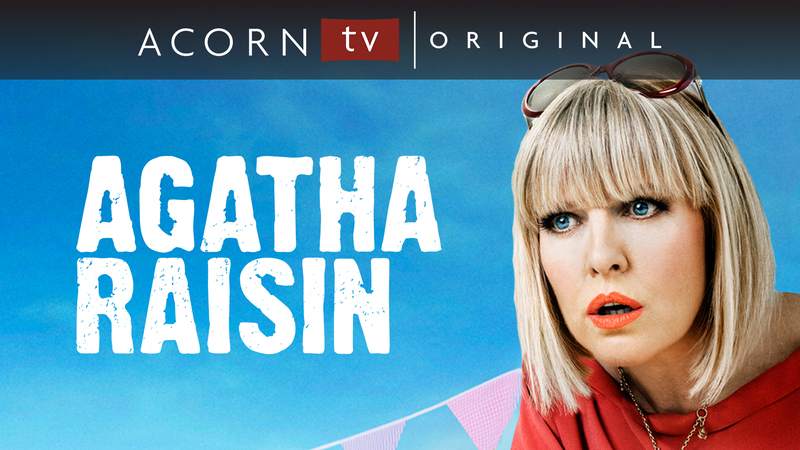 Based on MC Beaton’s bestselling books, Agatha Raisin remains one of Acorn TV’s most popular series of all-time, so it was a natural choice for the service’s first sole commission. Series 2 features three television movies. After Evesham in November, The Fairies of Fryfam will debut on Christmas Eve and The Curious Curate in late January 2019. Emmy®- and SAG-nominated actress Ashley Jensen (Catastrophe, Extras, Ugly Betty, Love Lies & Records) stars as a London PR whizz turned amateur sleuth, who becomes entangled in mischief, mayhem, and murder when she opts for early retirement in a small village in the Cotswolds. Acorn Media Enterprises (AME), the UK-based development division for the Acorn brand of RLJ Entertainment, Inc. (NASDAQ: RLJE), has partnered with Free@LastTV and Company Pictures to co-produce the new season. Agatha Raisin and the Wizard of Evesham follows Agatha Raisin returning from Cyprus with a broken heart, a frizz from hell and in need of a renewing pick me up. The local ladies all deem Mr. John a to-die-for wizard, so Agatha makes a beeline for the handsome Evesham hairdresser. And as well as sorting out her hair it soon becomes clear the charming man also has designs on her heart – but their future together is cut short when a murderer strikes at the busy salon. Agatha places her life in jeopardy to bring the killer to justice and once again Agatha finds herself embroiled in a murder case. Was it one of Mr. John’s many customers, all of whom divulged to him their darkest secrets? Returning for Series 2 are Agatha’s former assistant, Roy (Mathew Horne, Gavin and Stacey, Drunk History UK); her friend, Sarah (Lucy Liemann, Rev), eager Detective Constable Bill Wong (Matt McCooey); and village cleaner and friend, Gemma (Katy Wix, Torchwood). Coming up in October, Acorn TV has the exclusive premiere of fun travelogue VINTAGE ROADS GREAT & SMALL (Oct. 8) hosted by Christopher Timothy (All Creatures Great and Small) and Peter Davison (Doctor Who); new Welsh crime drama BANG (Oct. 15); fascinating new BBC doc YOUNG, GIFTED & CLASSICAL: The Making of a Maestro (Oct. 22); and the series finale of one of Acorn TV’s most popular series, addictive Aussie period drama A PLACE TO CALL HOME (Oct. 29, Trailer).